To tackle the ever-increasing problem of data hack, data breach, password theft and data leak Google introduced a new Chrome extension. Called the Password Checkup, it will help users against data breaches in their account. The extension also suggests changing the password if the user’s account details have been compromised. The tech giant also revealed a measure that it has implemented to make sure the apps and websites, where a user has used their Google account to sign in, is not compromised in case of a Google account hijacking. 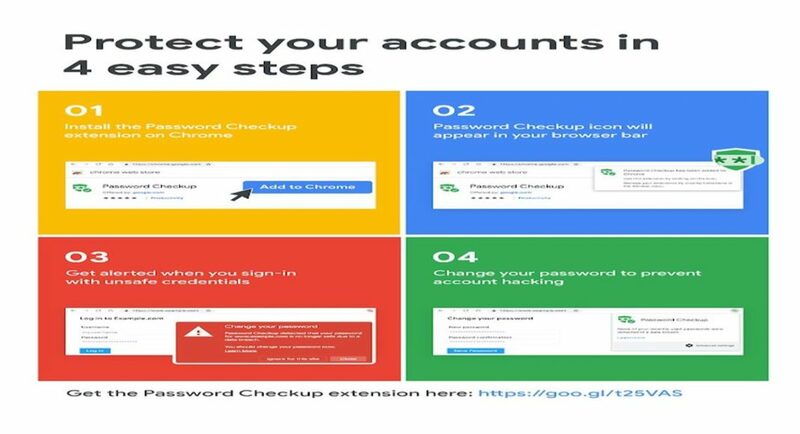 In a blog post on Tuesday, Google revealed that the new Password Checkup Chrome extension is now live on the Chrome Web Store and it can be downloaded by anyone who uses Chrome or has a Google account. This new extension alerts users when they enter a compromised username or password on a website. It also alerts the user when the extension finds out that the login information entered has been conceded and it suggests a password change to protect the users account so that no data is hijacked or leaked. The extension will be useful for the new users who can’t regularly keep track of their account or news about data breach and hacks, and it will also be helpful for basically everyone who uses a Google account on more than one place. Google also added that it has built the Password Checkup extension with user’s privacy concerns of sharing the account details with anyone, including Google itself. It also notes that no one, including Google will know about the users account information. But, when and if the user’s Google account is compromised, Google will notify the apps and websites where the user had used their Google account about the breach so that they can secure their account. “We built Password Checkup so that no one, including Google, can learn your account details. To do this, we developed privacy-protecting techniques with the help of cryptography researchers at both Google and Stanford University,” Google’s blog post read. Go on the Chrome Web Store and search for ‘Password Checkup’. Once opened, click ‘Add to Chrome’. Confirm that you want to add the extension to your Chrome. It will then install the extension. Once installed, a screen shield icon will appear on the top right of Chrome. Google also said that the Cross-Account Protection measure will make sure the apps and websites where the users are using their Google account credentials to sign in is not compromised in case an attacker gets hold of the user’s profile. It is the first time the company is improving the security of Google sign-in for third-party platforms. “We created Cross Account Protection by working closely with other major technology companies, like Adobe, and the standards community at the Internet Engineering Task Force (IETF) and OpenID Foundation to make this easy for all apps to implement,” said Google.